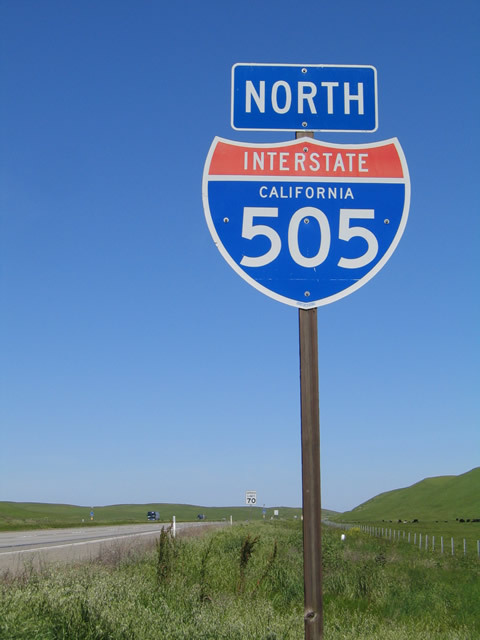 Interstate 505 runs north from I-80 near Vacaville to Winters and I-5 near Dunnigan. The freeway provides a fast route from the San Francisco Bay Area to Northern California and the Pacific Northwest. Originally incorporated in the Interstate 5W loop west from the Central Valley to Oakland in 1964, initial construction for Interstate 505 took place at the south end with Interstate 80 in 1968. Most of the freeway in Solano County was built in 1974. The Yolo County portion of I-505 was constructed as a two lane highway in 1959, with expansion to four lanes in 1980. 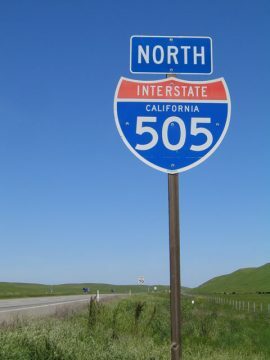 The northern section of Interstate 505 traverses a remote area across the Dunnigan Hills. Photo taken 03/31/05. An entrance ramp links Orange Drive, the east side frontage road for I-80, with Interstate 505 north at Vacaville. Photo taken 09/22/00. The northbound ramp for I-505 from Orange Drive connects the Vacaville Premium Outlets and a bevy or retail lining both sides of I-80 with the freeway leading north to I-5 for Redding. Photos taken 10/24/00. Road 12A meanders through Oat Valley parallel to Oat Creek to a diamond interchange (Exit 31) with Interstate 505. Photo taken 12/29/04. Freeway entrance for the northbound on-ramp to I-505 from Road 12A in the Dunnigan Hills. This assembly was missing by 2007, and subsequently replaced with a shield using non-standard font. Photo taken 12/29/04.